The VIA EPIA-M800 is the first EPIA Mini-ITX board to combine both the VIA Nano processor and the all-in-one VIA VX800 digital media IGP chipset. This potent combination provides enhanced media playback of the latest HD codecs in multiple display configurations. An ideal digital signage platform the VIA EPIA-M800 offers dual-DVI or DVI plus HDMI configurations with unique resolutions, pixel depths and refresh rates as well as two PCI-Express based Gigabit LAN ports to facilitate wideband data transfer for large video and other files over networks. The VIA EPIA-M800 also combines the highly adept multimedia performance of the VIA VX800 unified chipset with its integrated VIA Chrome9 HC3 integrated graphics core for DirectX 9.0 3D graphics. Up to six-channels of VIA Vinyl HD Audio offers rich surround sound, while the VIA Chromotion video engine provides advanced hardware video acceleration and an improved visual experience for range of codecs including WMV-9. 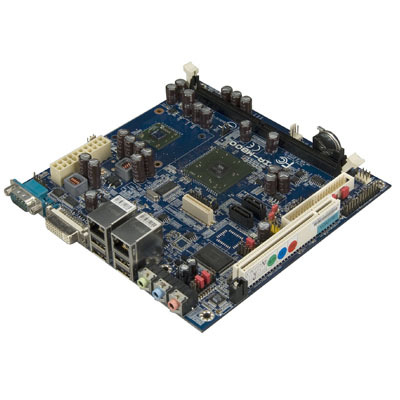 Storage includes both an IDE and Compact Flash shared connector, 2 SATA II connectors and up to 6 USB 2.0 ports. Connectivity comes in the form of dual Gigabit LAN ports on the high speed PCI-Express bus. Data protection is assured with the integrated VIA PadLock Security Engine and an MFX-01 module.